A few of the attendees at an Anjez event in Abu Dhabi in 2015. One of the topics my friends and I used to engage in during our lunch breaks in school was what we wanted to be when we graduated. Someone said being appointed a CEO of a bank would be ideal, another wanted to be an accountant at a leading firm, and I knew I wanted to work in a creative field. What we had in common was that we all wanted to work in a corporate. Not one of us uttered the word entrepreneurship back then- holding a prominent post at a well-known company was the goal at that point in time. Fast forward a few years later, and though most of us have worked in the corporate world, many of us have established our own businesses on the side, and we’re now working toward organic expansion. 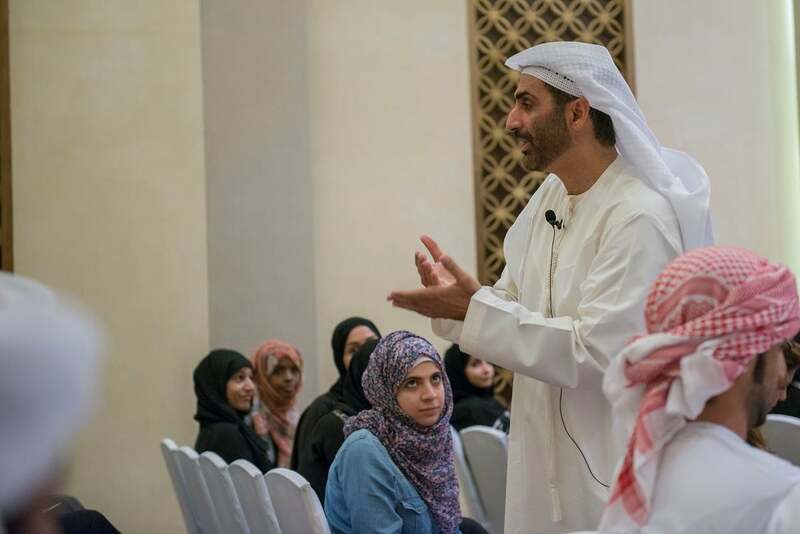 But while we may have not been of the entrepreneurial mindset when we were in school, today’s UAE youth are different. When I organized our first Anjez event in September 2014, I was able to really see the vast change in terms of Abu Dhabi youth and entrepreneurship. The event attendees were mainly Emirati high school and university students who eagerly asked our entrepreneur speaker questions about businesses they wanted to establish after graduating. These youngsters already had budding ideas about what they wanted to do after school, and starting up a business was on more than one person’s list. SMEs in the UAE currently contribute to more than 60% of the country’s non-oil GDP, and the UAE government aims to increase that figure to 70%. This intent has been displayed by various organizations in the country- for instance, the Khalifa Fund for Enterprise Development has helped finance more than 800 startups since its inception eight years ago, and twofour54, Abu Dhabi’s media zone, issues licenses and facilitates startups for freelancers and SMEs in the creative fields. From a personal standpoint, four of my friends have set up different businesses last year alone- many started up before them, and I know a couple more who will be going the entrepreneurial route soon. A look at Instagram today is enough to see the numerous microbusinesses currently operating in Abu Dhabi in sectors as varied as home décor, party planning, florals, and abaya design. Social media, mobile apps, and the different options to start up have made launching a business easier than ever before. An Anjez session in Abu Dhabi with H.H. Sheikh Abdul Aziz Al Nuaimi. Image credit: Anjez. That is precisely why I found that there was a need for more initiatives in the capital. An organized series of events throughout the year that offer networking opportunities to meet other entrepreneurs, and also attend mini-workshops where attendees hear stories from already successful entrepreneurs about their journey, and a way to exchange ideas and thoughts about how they too can develop a business. That’s how I got the inspiration for Anjez; it translates to “achieve” in English. It’s my homegrown initiative that supports budding UAE entrepreneurs through the aforementioned gatherings throughout the year. Each of Anjez’s events kick off with a networking reception followed by an individual from the GCC who has established a business giving a talk. We concentrate on highlighting local and GCC entrepreneurs, because we know that Emiratis and resident guests would relate more to speakers of similar backgrounds, and also it serves as a huge motivator for them to embark on their own entrepreneurial journey as well. The talks are limited to an audience of 100 people, and the rationale behind this is that we want people to be comfortable to network, to not have an overly crowded event, and to give everyone a chance to network with our guest speaker. As any initiative of this sort, supporters were vital, and that presented a great opportunity to ask different entities to come on board and support the initiative as part of their corporate social responsibility program and to be involved in an initiative that would help achieve Abu Dhabi’s 2030 vision of diversifying Abu Dhabi’s economy. Though government, public, and private enterprises operate differently, they all have one thing in common, and that is to be part of Abu Dhabi’s economic wheel and help push our country forward. And just like that, the initiative now has many supporters such as Invest AD – Abu Dhabi Investment Company, Paris-Sorbonne University Abu Dhabi, and Emirates Foundations’ Takatof, all of which provide different kinds of support. 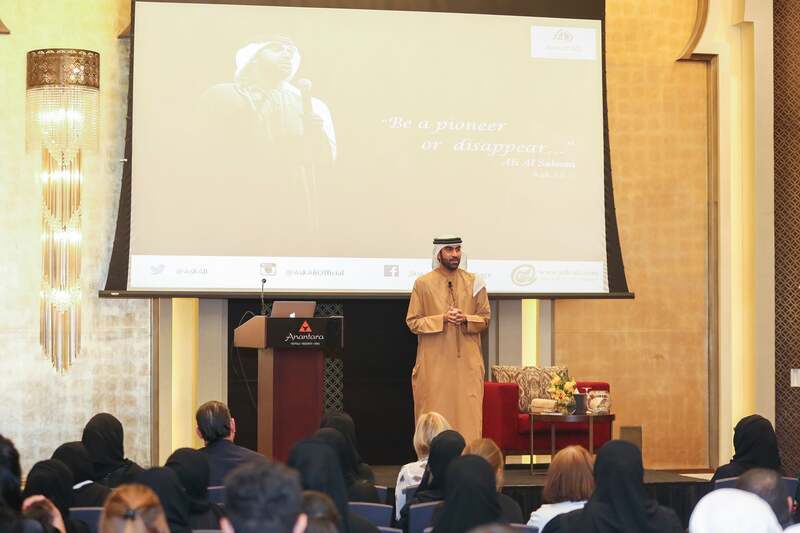 An Anjez session in Abu Dhabi with Emirati entrepreneur Ali Al Saloom. Image credit: Anjez. Last year, we staged three events with entrepreneurs from different fields: hospitality, sustainability advisory, and a branding agency, all sharing a wealth of knowledge. The events are always overbooked and almost every attendant is there because he/she has just started a business, wants to meet others in the field and would like to seek advice from peers and from our speakers. Though I have been an entrepreneur for six years now in addition to my corporate role, working on Anjez has been a huge eye-opener for me. Through networking with the attendees and the speakers, I have picked up new ways of doing business, I’m inspired by the energy the guests bring along, and I’ve seen firsthand how these events help bring founder together, and even has inspired others to finally do something about the business ideas they’ve been thinking of. If there is one thing I know for sure, it’s that between each Anjez event and the next, the number of people who sign up to attend increases, and it’s a reflection of the increasing number of budding entrepreneurs in Abu Dhabi- and that can only mean good things for the economic strength of the UAE both now, and in the long term.